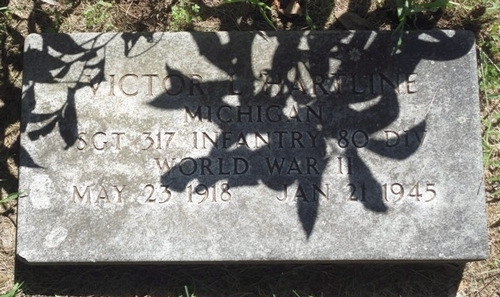 Victor L. Hartline, the son of Ray and Florence Hartline, was born on May 23, 1918 in Buchanan, Michigan. 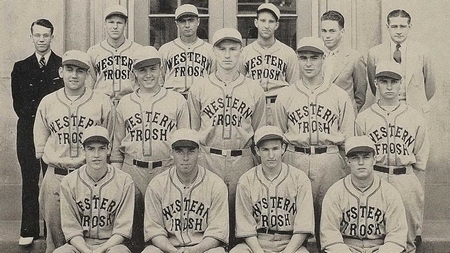 He graduated from New Troy High School in 1936, and attended Western State Teachers College (later Western Michigan University) the following year. Hartline worked as a utility man for the National Standard Company in Niles, Michigan, and played for their baseball team. The talented young infielder became well-known in the local area and also played for Studebaker and the Knights of Pythias in South Bend. Hartline was due for a tryout with the Chicago Cubs when military service beckoned. In 1944, he left behind his wife, Evelyn, and their young son, Ronald Lee, for service with the Army in Europe. Serving with the 317th Infantry Regiment, 80th Infantry Division, Sgt. Hartline was killed in action in Luxembourg on January 21, 1945. Originally buried at the American cemetery at Hamm, Luxembourg, his body was returned to Michigan in June 1949 and reburied at Oak Ridge Cemetery in Buchanan on June 16.